It's possible to change an existing ticket's requester to someone else and, if a requester belongs to more than one organization, you can also change the organization their ticket is assigned to. Note: Your Zendesk Support settings must be configured to allow CCs on tickets for you to be able to change the ticket requester. For details, see Setting CC permissions for tickets. Note: You can't change the requester on a ticket that has been shared or closed. You may want to change the user designated as the ticket requester if someone sent in a support request on someone else's behalf. The user who you want to set as the requester must be an existing user. Open the ticket where you want to change the requester. Next to the ticket requester's name, below the ticket title, click Change. The Requester field appears in the ticket properties panel. Begin entering a user's name, email domain, or organization name and the relevant results appear. Select the user. 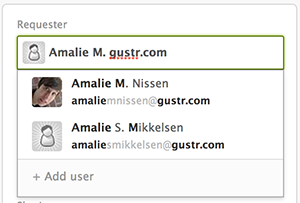 If the user does not yet have an account, add them by clicking +Add user at the bottom of the search results. Click Submit to save the ticket update. After you've changed a requester, you can later see who the original requester was by checking the ticket's events and notifications. On Professional and Enterprise, end-users can belong to multiple organizations. If a ticket's requester belongs to multiple organizations, the ticket can be assigned to any of the requester's organizations. Note: An administrator must enable multiple organizations for users (see Enabling multiple organizations for users). When a user who belongs to multiple organizations submits a ticket by email, it is assigned to their default organization. When the user creates a ticket in your Help Center, or when an agent creates a ticket on behalf of the user, the user or agent can select the organization for the ticket. You can change the organization for a ticket, if necessary. When a requester is removed from an organization, any tickets associated with that user and that organization, will be assigned to the user's default organization if the user belongs to multiple organizations. If the user does not belong to multiple organizations, the tickets will not be associated with an organization. When an organization is deleted, any tickets associated with the deleted organization will be assigned to the requester's default organization. If the organization that was deleted was the requester's default organization, one of the requester's other organizations will be promoted to default, then any working tickets will be associated with the requester's new default organization. If the user does not belong to multiple organizations, the tickets will not be associated with an organization. 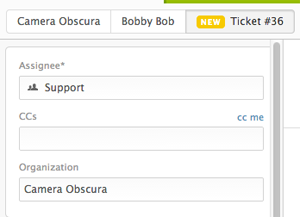 In the ticket, click the current Organization, then select one of the requester's other organizations. If the requester does not belong to multiple organizations you will not see the Organization field on the ticket. You can only choose an organization that the requester belongs to. The organization for the ticket appears in the ticket and at the top of the ticket. Re organizations we find it very frustrating not being able to change the organisation name of the requester unless the org has been added to the requesters profile, its also frustrating that an org can only be created by admins - i understand its important for consistency but we don't have the resource capacity for someone to add organisations for all new requesters. Thanks for the feedback on this. I did some poking around in our Product Feedback forum, but I wasn't able to find an existing thread about this. I'd definitely suggest that you pop over there and start a new post describing your suggestion and your use case for our Product Managers to review. They see all the posts there, and take customer suggestions into consideration as they work to improve Zendesk. When the requester is updated, should the ticket tags also be updated? When our support team updates the requester, the ticket tags are not updating to include those from the new requester/org. 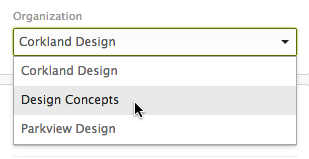 You would need to set up triggers to make those changes when a ticket is updated with a new requester/org. Let me know if you have more questions! It should be noted that the "Change" link will not appear unless you have the "Enable CCs on tickets" setting enabled. Mysterious. It appears as changing the requester is not possible in the overview view anymore, but can now simply be done directly inside the ticket. I guess the article should be updatet to highglight this. Can you specify which part of the article is incorrect? I can't seem to find what you're referring to. I'm referring to point No. 2. When I'm selecting a ticket, I cant see a "change" option on the screen. When wanting to change the requester I have to enter the detail view of the ticket and do it there. Step 1 is telling you to actually open the ticket you want to change the requester on, because it's only possible to do this from inside the ticket. I apologize that this wasn't clear! I'll touch base with our Documentation team to see if we can word this more clearly. You're right--that wasn't clear. I updated it to say "open the ticket." Thanks for letting us know! Is it also true that if no comment is added to the ticket after using the "change" link to edit to a different requester, the email is not received by that requester? That is what we have found and if that is true, it seems that wording about needing to add a comment should be added to this article. To add to that, we tried with a Private comment but the message isn't received unless we add a Public comment. Even if you've changed the requester on a ticket, a notification will not be sent out if there's no public comment on a ticket. This is expected behavior regardless of what other changes have been made to the ticket. If you want your new requester to know that they've been added to the ticket, you'll need to add a public comment to that effect so they'll get the notification. If this is something you do on a regular basis, you could even create a macro to automatically add that public comment to the ticket. Is there anyway to change the organization with the API. And if a ticket is created by e-mail, which organization is assigned to the user ? Would be very useful for me if you respond. With a ticket created by email, if there is an existing organization with a workflow set up for a user to automatically be assigned to it, it will automatically pull anyone with that email domain into the org. If their email address doesn't match or you do not have that workflow set up, no organization will be assigned. If you have any additional questions about the API piece, you should visit the Zendesk Developer APIs forum. Hi Nicole/Anton, what happened to the 'Change' link, shown at the start of the article? My team no longer has the option to 'Change' the requester? See attachment. We've had it / used it in the past with no issues. Thanks in advance. That's odd, it should still be there. You didn't change anything with your cc settings, by any chance? That could effect it. Hi Nicole, thanks for the reply. We did last week and I tweaked it today while troubleshooting, and presto - it's back. Thanks! Glad to hear that sorted it out for you. Have a great day! All my custom fields are then listed below. In the past, the top field was the requester field... now it's gone. Hopefully I'm missing something simple. Thanks. You're not missing anything; nothing has changed with regard to how those tickets fields appear. The ticket requester field only shows in the left-hand column on a new, un-submitted ticket, or when you edit the requester on an existing ticket. Once a ticket has been submitted, the requester displays below the ticket subject. Is there a way to change the "via" part of the requester? It's preventing us from deleting a user. Are the tickets where that user is listed in the "via" area still in un-closed status? Are you sure that there aren't any other un-closed tickets for which that user is actually listed as the requester? In either case, once those tickets are moved to Closed status, you'll be able to delete the user. In the meantime, you can suspend them so they can't access your Zendesk or submit tickets. Is this document still valid? I have CC enabled, but I do not see the Requester field on the ticket, and no "change" option. I see the Requester as a linked item on the ticket, but I can't see any way to change it. If I click the Requester button, I just see the Requester's user profile. If I click the ticket's checkbox in a list and select Edit Ticket, I don't see Requester there, either. Never mind, - I found it. It's to the right, in the header of the main conversation body area of the ticket. Hi Max! I'm glad you got it figured out! Hi Jessie! What is the purpose of the 'via [email address] information at the top of the ticket? I'm trying to understand this. We want to change the requester, but make sure the original requester doesn't receive any further responses. If we change the requester, and send a message after, who will see that message? Thanks! The purpose of the information you mentioned is to allow you to easily see who created the ticket in cases where the creator of the ticket is not the same as the requester of the ticket. If you change the requester on the ticket, any updates that are sent out will go to the new requester. Once a requester is removed from a ticket they won't receive anything else unless they're added as a CC. Is there a way to change the requester for multiple tickets in one go. For one of our customers, multiple tickets were submitted by a requester, lets call her Ms Bright. Some tickets are open, some are pending. Now Ms Bright has left the company. I have to change the requester in all the tickets from Ms. Bright to Ms. New. I have to do this for multiple requesters since 3/4 people have left the company. Is there an easy way to do this instead of wading through all the tickets and changing the requester field manually...? When does the requester field show in a ticket?